How do you analyse visual analogue scales with an ambiguous response? For example, I might ask participants to complete a visual analogue scale for pain. They would be given a line that is 100mm long, and one end says 0 (No pain) and the other end says 100 (worst possible pain). The participant is asked to make a mark on the line with a pencil or pen to rate their level of pain. I would then use a ruler to measure the distance from the origin. E.g. how many millimeters away it is from the start of the line (i.e. zero). The problem is that many times, people do not place a mark such as an x on the line, but they might circle a part of the line, or put a tick (check mark) there instead. I attach a picture of the standard response (participant 1) followed by 5 possible scenarios where the answer is ambiguous (participants 2 to 7), so I have left it as missing data/blank. Should these be excluded from the dataset (coded as missing data) or are some of them salvageable? By way of explanation: In number 2) the line is very large so there isn’t one place that it intersects the horizontal line (usually it has to be accurate to the nearest mm). Participant 3) has placed a circle on the line so it is difficult to say where on the line they meant. Participant number 4) has circled one of the numbers at the end. Can I be sure that they meant 0? Participant 7 is a variation on this. Participant 5) has placed a tick (check) mark underneath the line (or sometimes they place a tick on the line itself). Which part of the tick do I measure from? Participant 6) has placed a tick (check) mark on one of the numbers at the end of the scale. Can I be sure that they meant 100? What is the best way to minimize bias while maximizing the use of the available data? Any thoughts would be appreciated. I fully agree to AliceD's thoughts. If you have a large sample, these problems might add a little noise, but won't make much of a difference (certainly not the cases 2, 3, and 5, because the psychological resolution of the scale is unlikely to be as precise as the millimeter measure suggests anyway). In addition: If you want to be sure not to introduce any systematic bias yourself, the most prudent procedure would be to code this blind to conditions (if you have any) or other measures of the study. This way you can avoid that you unwittingly help you own hypotheses. Points #4 and #6 are obviously the most risky, especially in a small population. In a large population (say N=100) a few outliers don't matter too much. So in case the study sample is small, you may want to consider excluding uncertain cases (#4 and #6 as examples), or try to contact the subjects and re-assess. Not the answer you're looking for? Browse other questions tagged measurement methodology data or ask your own question. 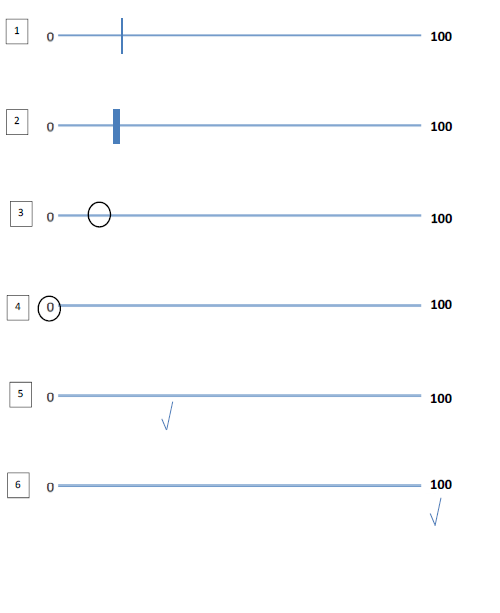 Can we use a scale even if one of the answer levels was not added?